I was at a writing inservice today with several other fabulous 4th grade teachers and the topic of cursive came up. California has added it to the Common Core standards for our state, so our students will continue to learn and practice cursive. Students learn cursive in 3rd grade, so in 4th I’m not really teaching it, just giving my students opportunities to practice. One of the ways I do this is by having them practice writing quotes by famous people. 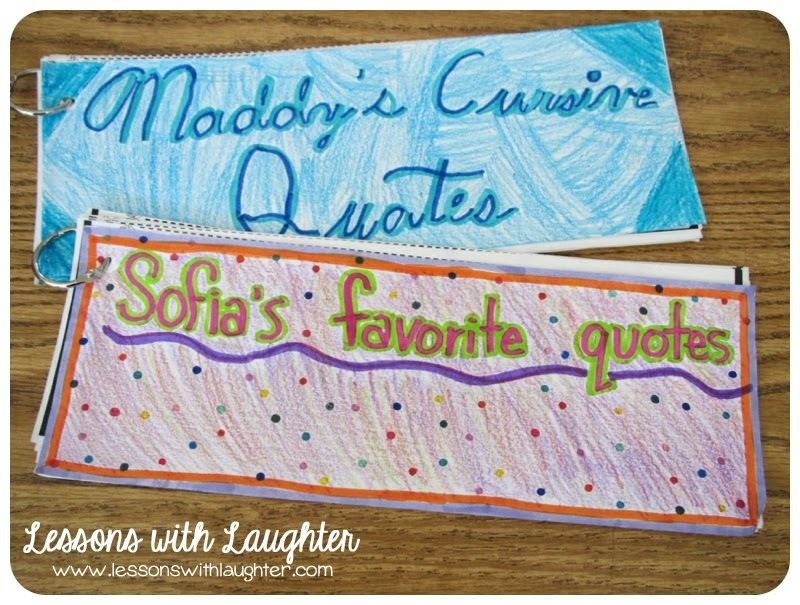 They compile all their cursive quotes into a book, which they take home with them at the end of the year! This is the book I get the quotes from. My sweet friend LeAnn lent it to me, and I loved it so much I ended up buying my own copy! The quotes are organized by character traits (attitude, leadership, perseverance, etc. ), which is a perfect link to character education. We also include a discussion on who said the quote, what it means, and how we can live by it. The students have the opportunity to practice writing three words from the quote several times (and then I have them circle their best one) before they write out the whole quote. I had them make a cover for their quote book and then attached them with a metal ring (I bought tons of them to attach my classroom library labels to the book bins and had plenty of extra!). Speaking of Character Education, I never got the chance to post about an amazing opportunity I had this summer! CJ and Ed are the coordinator and director of the USD Character Development Center. I met them a couple years ago while I was working on my Specialist Certificate in Character Development. They are both amazing educators and know so much about character education! This summer they invited me to speak at their annual Character Matters summer conference. It was such an amazing experience to be able to share some of the strategies I use to integrate character education in my classroom with other teachers! 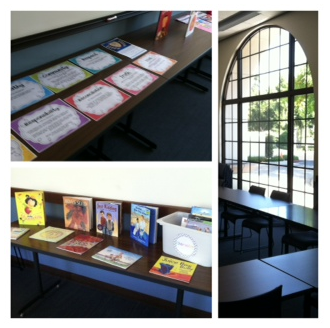 And look at the beautiful windows in the room I presented in! If you are interested in character education, their Specialist Certificate program is offered online, so it doesn’t matter where you live. It has really made a difference in my teaching and my students’ parents have commented on how they noticed the impact integrating character education into the curriculum has had on their children. Plus, having a positive classroom environment is always a huge priority for me! What time of the day do your students practice cursive? I would love to integrate it into a center or possibly have them practice as an early finisher activity. We really don't focus much on handwriting when they come to 4th. Our 3rd grade teachers like yours teach cursive. How fun – I'd LOVE to know more about the Character Matters conference. 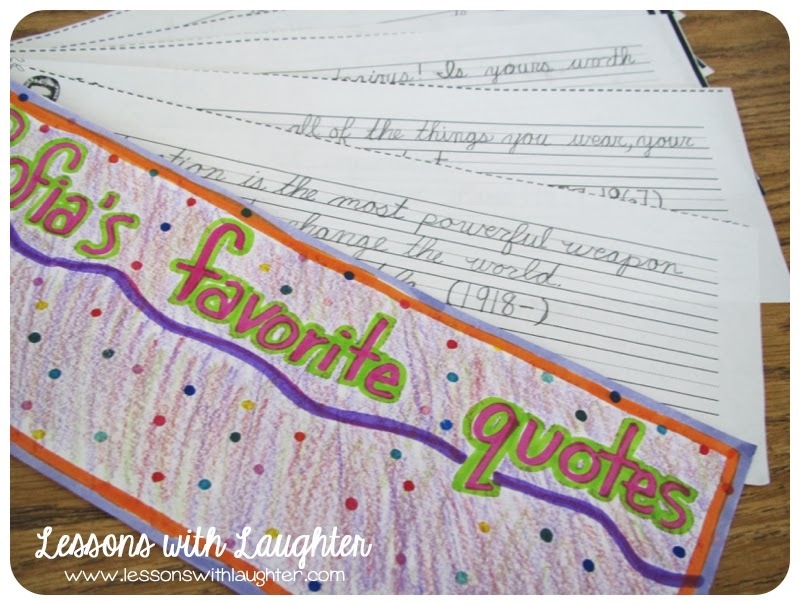 I love that you have your kids create a booklet with the quotes! Great idea! Congratulations on your awesome opportunity I am going to check this out! I absolutely love the cursive quote idea. I am definitely going do it this year. What a great way to practice cursive. This is so much better than worksheets! This is a wonderful idea and would fit perfectly in my class. I can't seem to find the name of the book you suggested though. Can you share that because it sounds like a great resource!! What a great idea! I love that it leads to something practical and that students have a finished product! I love the cursive idea too. It seems way better than the worksheets we do. Once my kiddos do a nice job writing in cursive ALL the time, I don't make them do the worksheets anymore. If they forget to write in cursive, I staple a sheet to the page they didn't write cursive in! Maybe these quotes could be a tri 1 thing. I'll be thinking about this! Thanks! Any suggestions? Hi there! My name is Alli. I am hoping to become a teacher soon! I found your blog on pinterest, and when I started reading it I really enjoyed it. After seeing a few other blogs I decided to make one too! SO I was wondering if you could take a look at my blog & tell me what you think? I am SO glad to hear that you are still doing cursive. It's one of my "soap box" topics… To make a long story short, to say "no one writes in cursive anymore" is a very narrow way to view things. For example, in some countries, the primary means of writing is cursive. I live in France, and starting in Pre-K, they *only* learn to write in cursive, not in print, because "if they wanted to write in print they could use a computer," so if kids didn't ever learn cursive, then learned French in high school, and went to France on a study abroad/just to see the world, they would very quickly find that they couldn't read anything hand-written. Plus, if ever they want to be historians, cursive was for a very long time the primary form of writing… so no cursive would mean no primary sources! Sorry. End of rant. But all this to say, I think this quote book is a great way to integrate cursive into the already jam-packed curriculum without spending too much time on it.